Much to the chagrin of France’s ruling UMP party, their former labour minister Eric Woerth grabbed headlines on Thursday. He was officially under investigation for “passive influence peddling” in a sprawling investigation into the misuse of the fortunes of France’s richest woman –Lilian Bettencourt. Woerth is suspected of grabbing a job for his wife from the man who manages Bettencourt's fortune, as well as helping that same man grab France's top civilian honour. Back in July 2010 Woerth was forced to quit his post as the UMP’s treasurer in relation to those allegations. His name was also sullied in relation to reforms to France’s pensions system – perhaps the most unpopular policy from President Nicolas Sarkozy’s time in office. The minister was cast away completely in a cabinet reshuffle in November 2010 and, until Woerth's appearence in court this week, we’ve hardly heard from him. Needless to say, his return to the land of the living is not part of a clever ploy to launch President Sarkozy’s still unofficial re-election bid. Less than three months before the French head to the polls, Woerth’s appearance in court was a golden opportunity for political opponents to slam the incumbent’s tenure. Indeed, Woerth belongs to a privileged list that French political parties would rather keep out of sight. And Sarkozy’s UMP is not the only one with an election skeleton. Without a doubt, the cache crown for this election is being worn by the opposition Socialist Party’s Dominique Strauss-Kahn. As a one-time French finance minister and former International Monetary Fund chief, Strauss-Kahn, in theory, could lend major economic credibility to Socialist candidate François Hollande's campaign. But after Strauss-Kahn’s internationally infamous sexual encounter with a hotel maid in New York - and a string of scandals that exploded in his face upon his return home – you can bet Hollande will keep a healthy distance from Strauss-Kahn on the campaign trail. Don’t expect any photo-ops with the Socialist’s leading man and “le perv” anytime soon. Besides Woerth, the UMP has another major liability that needs to be kept locked away until the election day smoke clears: former foreign minister Michelle Alliot-Marie. MAM, as she is known in France, is arguably the most accomplished female politician in French history. She was the country’s first woman to lead a major French party, first female minister of defence and first female interior minister. But then in 2011 a little revolt started in a little country called Tunisia. Who knew it would lead to the world-rocking Arab Springs that deposed tyrants in Tunisia, Egypt and Libya? Certainly not MAM, France’s top diplomat at the time, who at the start of the revolution suggested France lend the Tunisian regime its security expertise to silence those pesky demonstrators. MAM won’t be cheering on Sarkozy as he makes another dash for the Elysee presidential palace, at least not publicly. Greens are scrambling to carve out a bigger piece of France’s political pie and their hopes to win over undecided left-wing voters are currently riding on candidate Eva Joly. A former judge, Joly has struggled to inspire, even after provocatively calling for an overhaul of Bastille Day and Armistice Day celebrations. One of the their problems is that Green party member and former TV star Nicolas Hulot, and to some extent party heavyweight Daniel Cohn-Bendit, seem to naturally outshine the nominee. Hulot ran against Joly in the party's primaries and lost. Since then he has made like ozone and faded away, not backing Joly's bid. In January Cohn-Bendit even suggested he may vote for François Hollande. With friends like those, who needs enemies? Back in the good old days, whenever far-right leader Jean-Marie Le Pen needed a break, he knew he could pass the mic to National Front number two MC – Bruno Gollnisch. He could always be relied on to say something hateful about Jews or shake a crucifix at abortion defenders. That was then. Since Marine Le Pen took over the party for her father last year, she has been on a mission to soften the party’s sharp edges. She quickly went on the record as saying the Holocaust had been the “summit of barbarity” (good old dad once called it a “detail of history”) and fashioned herself as a champion of French secularism. In January, Gollnisch informed the press he would unfortunately be unable to attend an annual “right to life” march in Paris. It was one of only two press statements he has made since Marine began campaigning months ago. It seems clear that on Marine’s watch, Gollnisch only has the right to keep his mouth shut. There is one blog on France's 2012 presidential poll that delivers every campaign trail scoop plus the smartest election analysis. Or so we've heard. 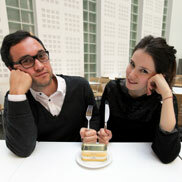 As a substitute, France 24 journalists Sophie Pilgrim and Joseph Bamat have combined forces to bring you Presidential Pâté -the greasiest and most savoury mouthfuls from French democracy's grand banquet.